Back in the world of LEGO (we do like it there) we're taking a look at something that not only gives insight into a new range of products, but also the yet-to-be-released film, Batman Vs. Superman: Dawn of Justice. We build, and then obviously muck about with, the LEGO DC Super Heroes Kryptonite Interception #76045 set. The set, which includes 300 parts and three minifigures, consists of two wheeled vehicles; one of which is of real interest... THE BATMOBILE, BABY! The whole thing took us about 90 minutes to complete, and it was pleasurable build with no tricky elements at all. The Lexcorp characters are new to this set and share the same printed torso, but have different legs, heads and hair pieces. One comes with a stud-shooter which has been slightly modified to give it more of a bazooka appearance, while the other is intended to drive the forklift. They both have alternate faces which make them look angrier, apparently at Batman. The new Batman Vs. Superman Batman is great, with very nice metallic speckles on the printed torso. The new logo looks good on his chest, while the helmet and cape are the same from previous incarnations (although the cape is of the heavier and more flexible new material we saw before in Batboat Harbour Pursuit). Bats comes with two baterangs to lob at the heavies and can comfortably sit within the Batmobile. The forklift and kryptonite casks are a nice build and they actually feel like a proper part of the whole set, and not just a bit of added value to up the part count. The truck features two of the old style flick-fire missiles and uses a white rubber band to give tension to the forklifting section. Hit the tab poking out of the rear of the forklift, and the whole driver's section flips up, catapulting the figure out. Either this is to recreate something from the actual scene in the film, or just a bit of an extra play feature courtesy of LEGO. And here is the real reason you want to own this set; the new Batmobile. This thing looks awesome from every angle and we can see a lot of other Batmobile designs in it. 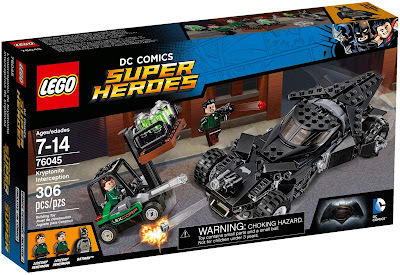 If LEGO's version is a fair replication of the movie car, this is something of an amalgamation of the Batman Begins tumbler, and the Tim Burton Batmobile. The vehicle has a really low profile with black and grey parts used throughout. It has two sizes of tyres and two different types of axle construction. From the rear it looks just like Christian Bale's tumbler, with the large exposed wheels and the flat body. There is a nice use of angled plate pieces throughout, to give the impression of armoured plating. Those plate pieces can be moved around a bit, either to copy their actual ability in the film, or just thanks to the design of the LEGO model. You get two stud-shooters on the front of the Batmobile, which we think ruin the lines of the car somewhat, but also realise that the movie vehicle has machine guns or cannons there as well. You get a couple of spare studs for them, thankfully(officially - although we were left with five extra studs in the 'left-overs'). The canopy splits open along the central axis and also tilts outwards thanks to some Technic joint parts. Bats fits in well, with his legs slotting into a couple of studs in the cockpit, although he does have to recline quite a bit. And yes, you can juuuuust see his little bat-face through the canopy windows. Just. So just as the movie is set to be released, this is a great set to get the kids excited. We really do love the Batmobile, and although you could argue that instead of including the forklift and the Lexcorp minifigs, the set could have featured a larger and more detailed car (or come in at a cheaper price), we think it all works very well together to make a great play set.